What is the difference between dextrins and dextrans? Cyclodextrins GeneralDextrans are soluble polysaccharides produced by bacteria and yeasts. They are characterized by a predominance (>95%) of α (1-6) backbone linkages and varying proportions of α(1-2), α(1- 3) and α(1-4) linkages typically at branch points 1, 2. Dextrins are partially hydrolyzed glucose homopolymers composed exclusively of α(1-4) backbone linkages. β-cyclodextrin is a cyclic structure composed of seven glucose units linked by α(1-4) linkages. Therefore it is a dextrin. 1Lehninger, A.L., (1975) Biochemistry, 2nd edition, pp. 264-266, Worth, New York. What are modified cyclodextrins and why were they developed? Cyclodextrins GeneralChemical modifications have been made by numerous researchers to alter the undesirable solubility and parenteral safety properties of the parent cyclodextrins. 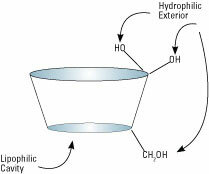 The modifications are mostly derivatives attached through the three available hydroxyl groups on each glucopyranose unit. Thus up to 18(α-CD), 21(β-CD), or 24(γ-CD) degrees of substitution may be realized, with numerous positional and regioisomers possible. How is Captisol® different from other modified cyclodextrins? Captisol® is a sulfobutyl ether derivative of β-cyclodextrin with a range of six to seven sulfobutyl ether groups per cyclodextrin molecule. Because of the very low pKa of the sulfonic acid groups, Captisol® carries multiple negative charges at physiologically compatible pH values. The four-carbon butyl chain coupled with repulsion of the end group negative charges allows for an "extension" of the cyclodextrin cavity. This often results in stronger binding to drug candidates than can be achieved using other modified cyclodextrins. It also provides a potential for ionic charge interactions between the cyclodextrin and a positively charged drug molecule. In addition, these derivatives impart exceptional solubility and parenteral safety to the molecule.